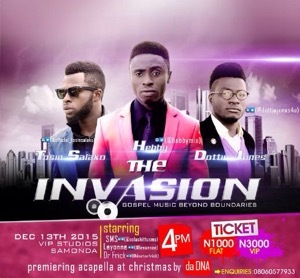 Something Great is about to happen in the city of Ibadan.. Its the biggest gospel concert ever in the city.. Featuring some dynamic gospel artistes with excellent vocal dexterity, unique delivery and awesome stage performance. With original composed songs…Tosin Salako,Hebby,Dottie,leyonne,smssholashitu,doctor frick. VENUE :38a oyo road samonda University of ibadan, Ibadan.